Note: Lug nut(s) not properly installed. Crew chief (Danny Stockman Jr.) has been fined $10,000. Note: Lug nut(s) not properly installed. Crew chief (Michael Kelley) has been fined $10,000. Note: Lug nut(s) not properly installed. Crew chief (Tristan Smith) has been fined $10,000. Note: Lug nut(s) not properly installed. Crew chief (Ryan Fugle) has been fined $2,500. NASCAR Monster Energy Cup Series driver Ricky Stenhouse Jr. will serve as a guest analyst for NBC Sports’ Monster Energy Supercross from NRG Stadium in Houston, Texas, this Saturday at 8 p.m. ET on NBCSN. Comprehensive live coverage of this Saturday’s Monster Energy Supercross event begins at 1 p.m. ET, with practice exclusively streaming on NBC Sports Gold’s Supercross Pass. Garrett Smithley returns to the seat of Spire Motorsports’ No. 77 Chevrolet Camaro ZL1 with primary sponsorship from Trophy Tractor for Sunday’s Monster Energy NASCAR Cup Series (MENCS) O'Reilly Auto Parts 500 at Texas Motor Speedway. Headquartered in Grand Prairie, Texas, Trophy Tractor offers a cost-effective alternative to the purchase and rental of new equipment with quality low-hour used equipment. Trophy Tractor specializes in the sale and rental of haul trucks, loaders, dozers, scrapers, excavators, compactors, graders, and water equipment. 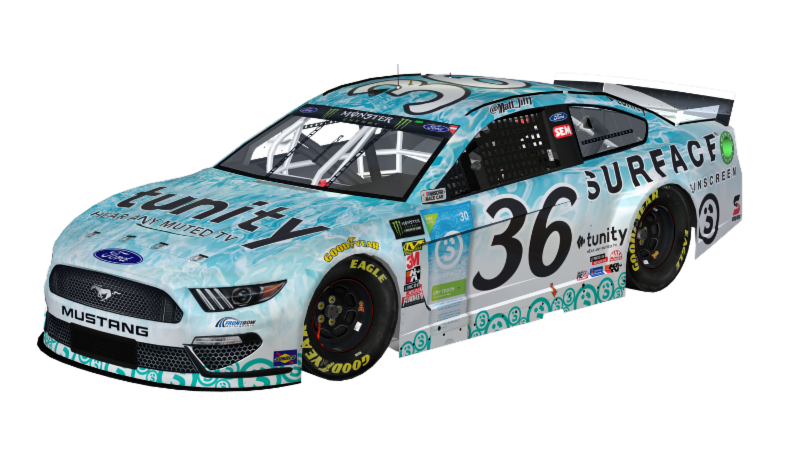 This weekend will mark Smithley’s third MENCS start of the season. His previous 2019 starts came at Atlanta Motor Speedway and Auto Club Speedway in Fontana, Calif.
“Jeff Miller and his team at Trophy Tractor have been great partners and friends,” said Smithley. “They are a group of hard-working people, who are committed to offering great equipment, at a great cost and, best of all, they do it with a smile on their faces. It’s an honor to represent the Trophy Tractor brand. It’s an honor to represent the Trophy Tractor brand and I know this is only the beginning." Spire Motorsports has fielded an entry for six points-paying races in 2019 with four different drivers including Smithley, Jamie McMurray, Reed Sorenson and Quin Houff. The O’Reilly Auto Parts 500 from Texas Motor Speedway will be televised live on FOX Sunday, March 31 beginning at 3 p.m. Eastern Standard Time. Flag-to-flag coverage of the seventh of 36 races on the 2019 MENCS schedule will be broadcast live on the Performance Racing Network and SiriusXM NASCAR Radio. The release of NASCAR’s radically different 2020 Monster Energy NASCAR Cup Series schedule offers a feast of competition that should please race fans itching for something new. “Bein’ Green” (also known as “It’s Not Easy Bein’ Green”) was a song originally performed by Jim Henson as Kermit the Frog on both Sesame Street and The Muppet Show. It was later covered by Frank Sinatra and other performers. In the Muppet version, Kermit begins by saying he feels like green “blends in with so many ordinary things” and wishing to be some other color. But by the end of the song, Kermit says that the color green isn’t so bad and decides to embrace it.